Wonder How To is a useful video site that shows you how to do something in video. 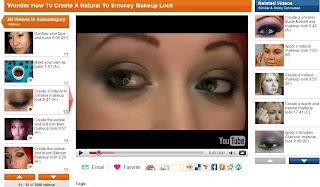 It collects huge instructional videos that lets you easy to browser and watch video. The category included different subjects that from alcohol to art, from computer to language, and so on. Wonder How To does not host any video, these videos all are from over 1700 video websites. It lets you submit video link but not upload it to its server. It is a useful site if you want know how to do something, video instruction is better than text.